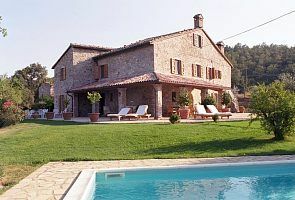 Villa with cottage, pool, spectacular view of Todi ~ NEW 2017 LOWER RATES!! Amenities of Santa Cristina: WI-FI, Fireplaces (living room, kitchen, cottage), Fireplace w/ insert (living room), Pellet-burning stove (cottage), Phones, Satellite TV, Bose radio/CD player. Gourmet kitchen, Whirlpool dishwasher, Miele refrigerator-freezer, Ocean refrigerator-freezer, 5 burner Smeg stove w/ electric convection /conventional oven, Cooking utensils provided, Linens provided, Pool towels provided, Rex washing machine, Whirlpool washer and dryer, Hair dryers, Orthopaedic beds, 2 Baby playpens + 1 High Chair (*please request), Country antiques, Private pool (12 m x 6 m = 36'x18'), Outdoor shower at poolside, Weber charcoal grill (BBQ), Catered meals, Vegetable garden for guests' use, Wide patios, Portico w/ dining table for 12; Outdoor couch, club chairs, coffee table; Garden and pool furniture (beach loungers from Rimini! ), Gated and fenced property, Screens on doors and windows, Ceiling fan in master bedroom, Portable fans, Informational notebooks. 2 Bicycles. NO Smoking, NO Pets, NO Candle Burning. Distances from Santa Cristina: *2 km. to Izzalini with bakery and bar, antique and furniture shops. *6 km. to Collelungo with grocery. * km to Ponte Rio with all shops, bank, gas station. * km. to Spa in Melezzole. *12 km. to Todi/20 minutes by car. * km. to Orvieto/45 minutes by car. *1 hour to Perugia. *1 hour to Assisi. *1.5 hours to Rome. *2 hours to Rome Airport (Fiumicino). *2.5 hours to Florence. COMPLIMENTARY *wine and *extra virgin olive oil, both products from the estate, as well as *fresh vegetables and *herbs from the garden. Additional *extra virgin olive available for purchase. Michael and Grace Palescandolo, a couple from New Jersey, lived in Bologna for five years after they were first married. After they returned to the USA, their hearts remained in Italy, having experienced and savored 'la dolce vita.' Both of Italian heritage, their fathers and numerous relatives born in Italy, it was their dream to plant roots in their native land. In 1998, their dreams became reality when they purchased Santa Cristina. the renovation was such a positive experienced that they purchased their second villa Domus Gratia in 2003. Michael and Grace produce olive oil exclusively from the 1000 trees on their properties, as well as red and white wine from their vineyard. Vegetables, rosemary and sage are cultivated on both properties for enjoyment by their guests. Michael and Grace enjoy traveling to Italy with their children, relatives and friends. Their villas are splendid for celebrations and gatherings. They welcome their guests with open arms. Their on sight property managers are Mario and Giuseppina and Elena. Mario is a professional farmer, caring for the olives and vineyard, as well as maintaining the villas, green lawns, flowers and the pools. Giuseppina caters delicious meals upon request, and does a superb job keeping the villas spotless, and bed linens and towels fresh. Elena speaks English, welcomes the guests at arrival, facilitates check out at departure, assists with the catered meal service, and is able to babysit upon request. Come, experience Italy and 'la dolce vita!' Welcome! Benvenuti! toilet, shower, bidet, Large marble walk-in shower. Heated towel rack in winter. toilet, shower, bidet, Large walk-in marble shower. Heated towel rack in winter. toilet, combination tub/shower, bidet, Heated towel rack (when heat is on). *The master bathroom and the two bathrooms on the first floor have separate sink / toilet, bidet, bath-shower areas. One guest is able to utilize the bath-shower, toilet, bidet area while another guest utilizes the sink area. This plan expedites time during the morning wake-up. *All bathrooms have heated towel racks (when the heat is on). GROUND FLOOR: Large gourmet kitchen includes 5 burner stove with oven, refrigerator-freezer, dishwasher, fireplace; marble work island, counters, sink; professional cookware, all kitchen equipment. Dining room for 10-14. Spacious living room with entertainment, fireplace, and card table areas. Laundry room with 2 washing machines, dryer, extra refrigerator-freezer, utility sinks, iron & ironing board. Full bathroom w/large walk-in shower and heated towel rack. UPPER FLOOR: 3 Bedrooms with orthopaedic queen beds. 1 Bedroom with 2 orthopaedic twin beds. 2 Full bathrooms with heated towel racks. 1st Bathroom has bathtub with shower over tub. 2nd Bathroom has seated shower. Both bathrooms have separate areas with sink. The sink area in each of these 2 bathrooms could be utilized while the shower / bath tub and toilet areas are in use. MANSARDA: 1 Bedroom with orthopaedic queen bed. Full bathroom en suite with large walk in shower. Separate area with sink and heated towel rack. Our family had a wonderful time at this lovely property outside of Todi. We have been coming to Umbria for years and have never had such spectacular views. The owners and caretakers were very helpful and accommodating and the house had a fabulous layout - very easy with children. We would highly recommend this property to our friends and family and would definitely come again. SANTA CRISTINA is ideally situated for visiting Umbria and southern Tuscany: Todi, Orvieto, Perugia, Assisi, Spello, Trevi, Gubbio, Spoleto,Deruta, Montefalco, Amelia, Bevagna, Lake Trasimeno, Lake Bolsena; Montepulciano, Pienza, Cortona, Montalcino. It is located near the E-45 Superstrada to all Umbrian destinations, and the A-1 Autostrada del Sole to Rome (1.5 hours) and Florence (2.5 hours). *2 km to Izzalini: bakery, bar. *6 km to Collelungo grocery. * km to Ponte Rio with shops, gas station, restaurant, groceries, bank, Tudernum Winery, jeweler, fresh cheese shop, housewares. *12 km to Todi / 20 minutes by car.